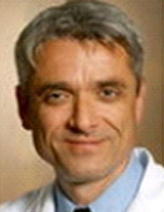 Sergio Fazio, MD, PhD, is the Cornelius Vanderbilt Professor of Medicine and Pathology at Vanderbilt University School of Medicine in Nashville, Tennessee, where he is Chief of the Section of Cardiovascular Disease Prevention. After earning a medical degree from the University of Rome in Rome, Italy, Dr. Fazio completed an internship and residency in internal medicine and was a clinical fellow in metabolic diseases at the same institution. In addition, he holds a doctorate in experimental medicine from the University of Siena in Siena, Italy. Dr. Fazio’s clinical interest is in the management of patients with dyslipidemia. He participates in clinical trials and is involved in the determination of newmutations that cause altered lipid levels in humans. His research interests are focused on the pathogenesis of genetic dyslipidemias, the early cellular events of atherogenesis, and gene therapy approaches to atherosclerosis. An Established Investigator of the American Heart Association (AHA), he is currently principal investigator or co-principal investigator on several studies sponsored by the National Institutes of Health. The results of Dr. Fazio’s research have been published in such prominent journals as The New England Journal of Medicine; Nature; Science; Arteriosclerosis, Thrombosis, and Vascular Biology; and Circulation. He is also the author or coauthor of several review articles and book chapters on lipid metabolism and atherosclerosis. Dr. Fazio serves on the editorial boards of The Journal of Clinical Lipidology and Arteriosclerosis, Thrombosis, and Vascular Biology. Dr. Fazio is a member of the American Federation for Clinical Research, The American Society for Clinical Investigation, and the Association of American Physicians. He has been a Fellow of the Council on Arteriosclerosis, Thrombosis and Vascular Biology and the Council on Nutrition, Physical Activity, and Metabolism of the AHA, and a board member of the Clinical Lipidology and Thrombosis Committee of the AHA.